Why was I so obsessed with Easter Island when I was younger? In what books did I discover the mysterious moai of Rapa Nui? What exactly cultivated my fascination with this tiny, far away speck of land in the Pacific? 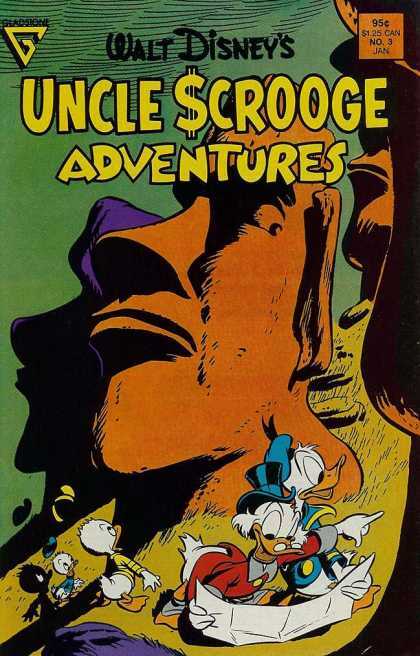 Was it Uncle Scrooge Adventures #3? Now, I had a thing for Disney comics growing up, and the iconic cover of that particular issue of the Gladstone (R.I.P.) publication is one of my favorite covers of all time (in fact, I display it next to my “mini” moai that I procured at a local artisan shop on Easter Island when I visited in August 2012). However, I never actually owned that issue until recently as I didn’t start reading comics until the early 90’s (this issue is from January 1988). Be that as it may, the imagery of Easter Island bundled with a fantastical imagination fostered in the swashbuckling tales of Disney’s duck family (Scrooge, Donald, Huey, Dewey and Louie, et al.) would have a profound affect on any young mind. The ducks’ adventures could have been anywhere, and my favorite stories often were set against the backdrop of the South Pacific. 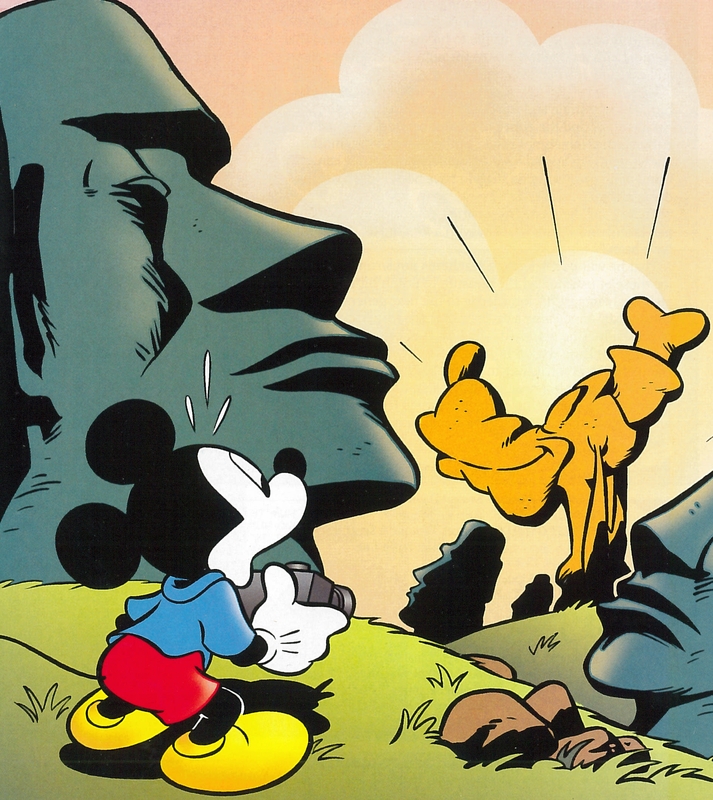 Looking back, It’s no surprise that the ducks actually visited the “real” Easter Island in the comics, it just naturally fit right in with the story lines. I actually discovered the issue of Uncle Scrooge Adventures while searching for Easter Island related items on ebay. To my surprise, I found a litany of comic books with related imagery from the island, many from the Golden and Silver-age of comics, from DC and Marvel, to other, smaller publishers. I decided to do some amateur research, and see just how pervasive this island was in the comic book culture. Mr. Peabody and Sherman go back in time and carve likenesses of the Rapa Nui people, essentially answering the question as to why the statues exist. 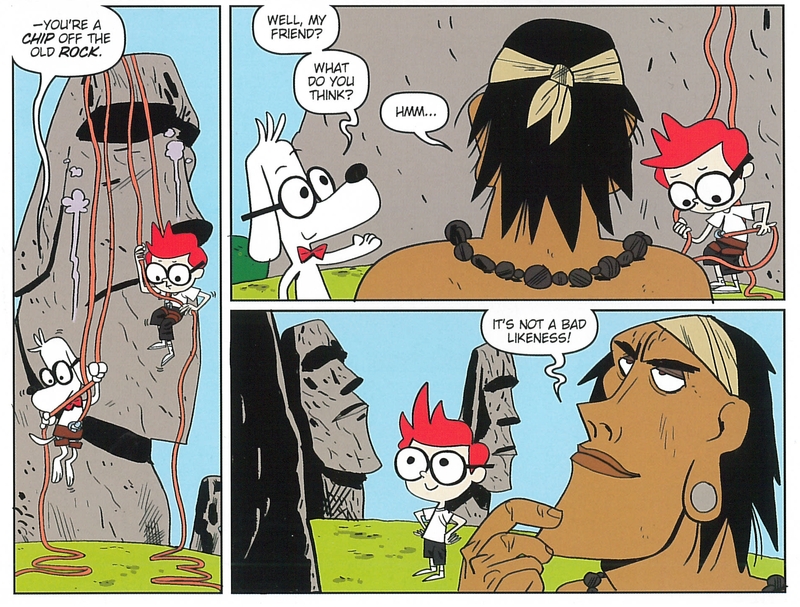 (Mr. Peabody and Sherman #2/IDW/December 2013). I was absolutely astounded when I stumbled on a research paper on this very topic. Dr. Beverley Haun, who essentially wrote the book on society’s view of Easter Island (Inventing Easter Island, 2008), published an article detailing the history of the island in American comics (full text here). This paper is tremendously important insomuch that it affirms to me that anything I dream up for this blog is actually worthy of someone else’s time. Jokes aside, it gave me a “Cliffnotes” head start on my list, as Haun details her findings, issue-by-issue, in the 11-page paper. Haun’s research ends somewhere in the mid-2000’s, though I’ve managed to find about a dozen more comics produced since then with imagery and references to the island (including a few Haun missed during her time frame). 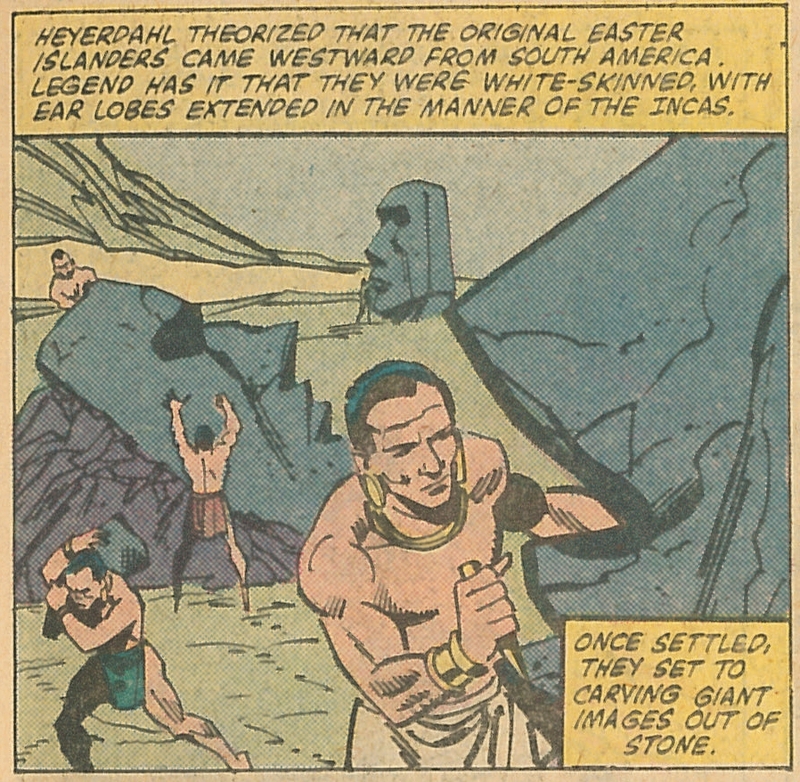 I suppose one could lay the blame on Jack Kirby, the legendary comic book artist, who was so taken with Easter Island (and society’s interest with the Thor Heyerdahl expeditions at the time) that he penned multiple cover stories featured the island’s stone men. Kirby wasn’t the first to put Easter Island in the comic books, in fact it was a much lesser-known man named Chad Grothkopf who penciled the first story featuring the island. Grothkopf’s story, “The Easter Island Gods”, appeared in Action Comics #28, just two years after Superman’s debut in the premier issue of that series. After reading Haun’s article as well as numerous internet forum posts that have brought up the Easter Island “comic” experience, it’s easy to see how the island has been so important to so many comic canons throughout the years. There is only mystery with Easter Island, no absolute truths. Anyone can take the setting and run with it, spinning the tale any which way they please. It’s just all too convenient. In fact, many of the books in the comprehensive list I’ve put together ignore the realities of the Rapa Nui culture altogether (as Haun notes, some stories depict an island that is devoid of population) or make no direct reference to Easter Island by name (but instead draw inspiration from the moai). Any way you cut it, the comic book is almost as American as apple pie and baseball. The wondrous characterizations of the famous stone men coming alive on a faraway island have assuredly influenced many children throughout the years. I, too, credit much of my interest in seeing the world to my enthusiasm for comic books at a young age. Here’s hoping the medium continues to inspire many more travelers and explorers to come. As always, with lists like these, no research can be considered absolutely exhaustive. Feel free to comment on needed additions or corrections. I’m all about crowdsourcing here!